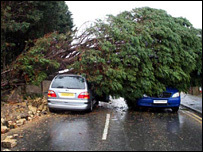 Heavy seas and winds of up to 80mph (128km/h) have battered parts of England, causing chaos on roads, railways and at airports and ports. Flights at Heathrow and Gatwick airports were cancelled, speed restrictions put in place on railway lines, and roads and ports were closed. The AA said it was on course for its busiest day of the year so far. About 7,000 homes in south-west England were left without power due to the severe storm. An AA spokeswoman said it was predicting to receive 16,000 call-outs during the day, compared with an average of 9,500. She said: "As well as breakdowns, the AA is being called to deal with cars damaged by falling branches and other debris and affected by localised flooding. "The AA is warning drivers to slow down and take extra care on the roads. "Drivers will seriously endanger themselves and other motorists if they underestimate the power of wind gusts and drive too fast." In West Sussex, 30 people were rescued from a caravan park after flood defences were breached. In Cornwall, more than 30 properties in the seaside towns of Looe, Fowey, Mevagissey and Flushing were hit by wind-driven high tides. Parts of north-east England were also hit by snowfall, with snow ploughs needed to keep some roads open. While flood warnings in Devon and Cornwall were downgraded later on Monday, the Environment Agency said the Bristol Channel, Severn Estuary and Somerset coast remained at risk of flooding. There were 33 flood warnings in place in England and Wales at 1600 GMT on Monday. As forecasters warned of more to come, bulldozers were being used to build up shingle to protect the coast in Sussex and Kent. 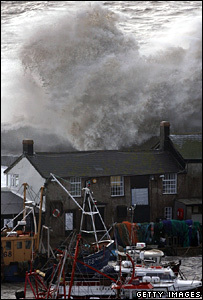 The Environment Agency has urged people to stay away from exposed coastal areas. Flooding caused lane closures on the M25, while the Port of Dover was forced to close, with P&O Ferries unable to operate any of its Dover-Calais sailings. It was later reopened.